The easiest way to carry skis for any distance, is to put the skis on your shoulder and hold them with one hand. To do this, the first thing you need to do is put the skis together. With the skis standing vertically, hold each ski by the toe housing on the binding. With one ski slightly higher than the other, put the skis base to base, and slide the higher ski down along the other ski until the brakes lock together. Having the skis like this stops them from coming apart so easily, and makes them a lot easier to carry. Then being careful not to hit anyone or anything with the skis, put the skis on your preferred shoulder, with the area just in front of the bindings resting on your shoulder. When you do this the the ski that was higher when putting the skis together, needs to be the bottom ski that rests on your shoulder. This will stop the top ski from being able to slide forwards, and make the skis much easier to carry. 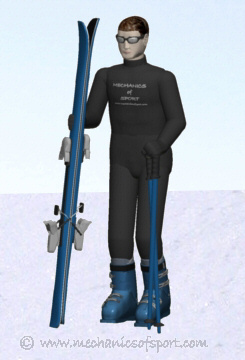 To hold the skis in position, push down gently towards the ski tips with the hand on the same side as the shoulder the skis are resting on. Now hold your poles in the other hand, and you are ready to carry your skis wherever you need to go. When carrying skis like this please be careful not to hit anyone or anything with the skis. 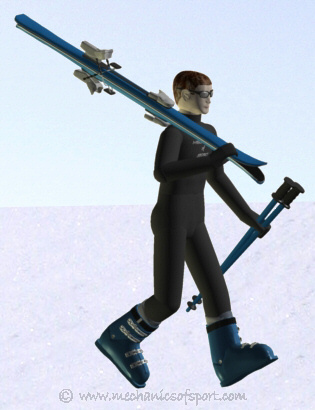 Do not swing the skis around while you walk, and be aware of the back of the skis when you go around corners. With the added difficulty of walking in ski boots, and through snow, extra care needs to be taken while carrying skis. If you come to a slow moving, crowded area, like a lift queue. Carefully take the skis off of your shoulder without hitting anyone or anything, and stand them vertically next to you, holding them with one hand around the area just above the bindings. Holding the skis like this, takes the weight off of your shoulder, and is a lot safer for the people around you. When you move forwards, simply pick the skis up and put them back down with the one hand as if the skis were a large walking stick. You can also pick the skis up and carry them while they are vertical by holding the toe housing on the ski that is underneath when you slide the skis together. On to the Snowplough section.